Thanks to a little kindness and understanding from a softball coach, Oklahoma now has a new record typical elk in its Cy Curtis Awards Program. And the record-holder is just 15 years old. Olivia Parry of Camargo was just 14 and on her first elk hunt when she bagged the bull elk on private land in Dewey County on Oct. 16, 2016. After the mandatory drying period, the 5-by-5 rack was scored at 377 6/8, shattering the existing Cy Curtis record by 39 2/8. Olivia and her father, Scott Parry, who is the Northwest Region Wildlife Supervisor for the Oklahoma Department of Wildlife Conservation, began the hunt the previous evening. Olivia said that is when she first saw the big elk that would become the focus of the hunt, but shooting hours closed soon after. The next morning, father and daughter were in the field again, and it was a dusky morning, Olivia recalled. As the morning brightened, she began using binoculars to scan her surroundings. “And we were just sitting there waiting around, and he popped out on our hillside.” Nothing to do but wait, she thought. By this time, the morning had slipped into afternoon, without any chance to take a shot. So Olivia and her dad decided to take a break, allowing Olivia to attend softball practice in Laverne with her team. But the elk hunt was still on her mind. “I asked the coach if I could leave a little early,” Olivia said. The coach agreed, and Olivia arrived back in the field about 5 p.m. And it wasn’t long before the big bull ambled into the open, and the Vici High School freshman lifted her .270-caliber rifle and squeezed the trigger. “I started crying because I thought I’d missed him,” she recalled. But her shot hadn’t missed. As they looked over the trophy, Parry told his daughter it could well be a state (Cy Curtis) record. But Olivia said she could not comprehend what that meant at the time. Later, when they delivered the bull elk to be processed, the processor remarked how big the rack was, and that it might be a new record. That’s when the magnitude struck her. 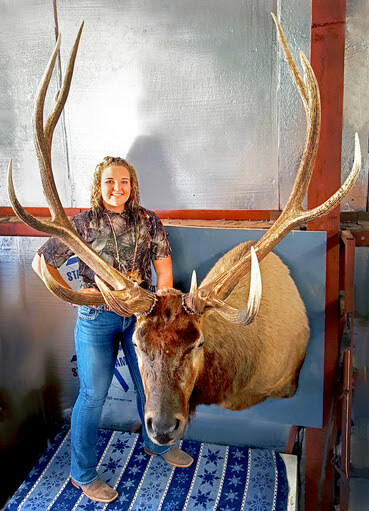 The score qualifies Olivia’s elk as a Boone and Crockett Club All-Time Record and will forever be listed in Records of North American Big Game produced by that organization. Even though she is a seasoned veteran of deer hunting – she bagged her first doe at age 11 – Olivia has now decided she enjoys elk hunting most of all. Still, she is fond of deer, turkey and dove hunting, too.